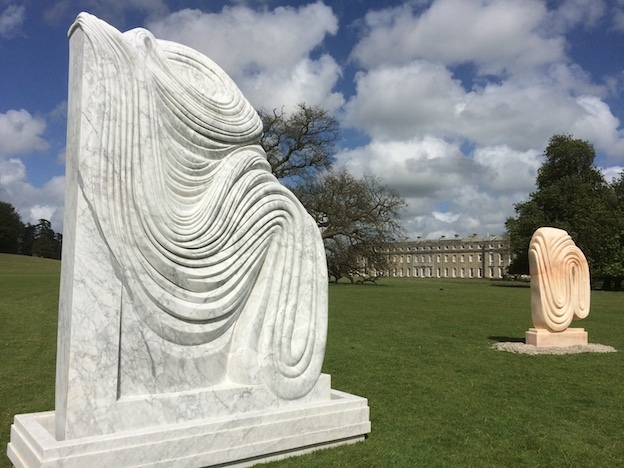 Paul spent a very blustery day yesterday installing three sculptures in the magnificent grounds of Petworth House in Sussex. The beautiful site was designed by Capabilty Brown and at one time was a brief home for Turner as he painted its then-owner, the third Earl of Egremont. With such prestigious connections Paul feels quite honoured to have his work set up there and did wonder for a moment what Turner would of thought to look out the window and have his view interrupted by the new artwork! This is the first Petworth Park Antiques & Fine Art Fair (£10 entry fee) and will run from May 8-10 in a large pavilion by the lake. Tickets also obtain entry to the house. Do let us know if you visit. This entry was posted in news on May 6, 2015 by Paul Vanstone.